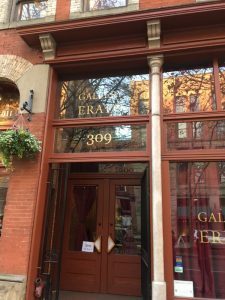 When attending events at Gallery Erato, we encourage the use of public transit or a ride share to Pioneer Square. The Gallery is within a quarter mile to bus stops and a light rail station. If traveling by car, consider taking transit from a park-and-ride. For parking a car, we recommend using Call To Park or DowntownSeattleParking.com because both of these sites offer real-time pricing and space availability. Street parking in Pioneer Square is free after 6pm and on Sundays. Please note that while parking is free on Sundays, there is a still a time limit and your car must be moved every 2 hours. Parking enforcement patrols the neighborhood seven days a week. Please do not leave valuables visible in your car; put them in your trunk or bring them inside with you. We have a coat check room available to attendees. Depending on the event, coat check will either be free and self-serve, or staffed with a suggested donation. Please note that from mid-January until approximately July 2019, there will be increased traffic congestion in our neighborhood due to the re-routing of HWY 99 and the demolition of the viaduct. For tools on different ways to get around Seattle, check out www.seattle.gov/traffic. Parking under the viaduct, one block west of Gallery Erato, will remain available until demolition begins in May. Bathrooms are marked with braille signs. We have the ability to give educators microphones to assist with hearing challenges. Please allow our staff to help out with any other accessibility issues during any event you may be attending. You may also email us at [email protected] in regards to accessibility. Due to its status as a historic building, we are limited to what kinds of changes we can make to the building. We are currently investigating and planning for improved accessibility through out the Gallery and Studio. 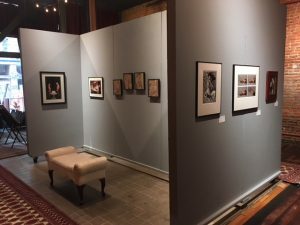 Gallery Erato features a rotating selection of artists whose works focus on sexuality, gender, orientation, identity, relationships, and social mores. With a special focus on works of art that depict or explore “alternative” sexuality, Gallery Erato aims to provide a space to understand and honor the joy in all sexual and romantic expressions. We believe that art can build bridges of understanding and acceptance, as well as providing affirmation to under-represented communities and populations. Art shown on the Gallery walls changes every four to eight weeks. Smaller original works and merchandise such as prints, books, or pins are often available after a show ends, while supplies last. The Gallery is open for browsing and shopping every Thursday from noon until 6pm, with extended open hours until 9pm every First Thursday as part of Pioneer Square’s First Thursday Art Walk. 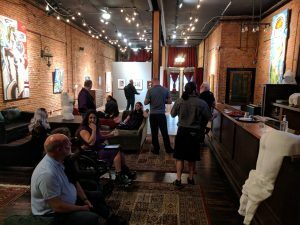 If you are interested in having your art shown at Gallery Erato, please apply via this online form. 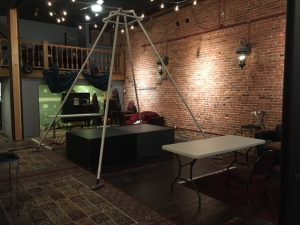 Gallery Erato is available to rent for your private or public event. Please email our Rental Manager at [email protected] for more information, availability, and quotes. The Pan Eros Foundation acknowledges that we gather on Indigenous land: the traditional territory of Coast Salish peoples, specifically the Duwamish Tribe (Dkhw Duw’Absh). You can learn more at duwamishtribe.org, and if you live in King county, you may wish to check out the Real Rent program.